Volunteers needed for balsam bashing! 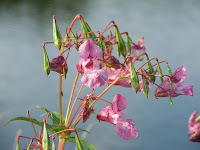 Himalayan balsam is a present nuisance in the Ullswater valley and in recent years volunteers from a number of agencies, notably the Lake District National Park Authority and Eden Rivers Trust, have had some success in dealing with the problem. Since 2007 there has been a steady decline in the spread of the weed in the Ullswater valley but each year we seem to find a previously undiscovered infestation. In 2014 it was in an obscure tributary of Mires Beck above Glenridding. In the early years it seemed only possible to stop the spread of the alien weed but more recently it has become apparent that total eradication may be possible, as has already been the case in the Lowther valley. Have you seen this Alien ? Himalayan balsam (Impatiens glandulifera) is a relative of the houseplant commonly known as Busy Lizzie. It is known by a wide variety of common names, including Indian balsam, policeman's helmet and jumping jack. Growing to a height of more than 2 metres, it is the tallest annual flower in Britain, producing clusters of purplish pink helmet-shaped flowers. These are followed by seed pods that open explosively when ripe, shooting their seeds up to 7 metres away. Each plant can produce up to 2,500 seeds. Whilst an attractive plant, it really has no other virtue and, where it now grows wild, is generally regarded as an alien invasive weed. Introduced to the UK in 1839, it is now naturalised, especially alongside water and increasingly in waste places. Few plants are now found around Glenridding where work was focused in the early years but there are a number of locations in and around Patterdale, on the eastern shore from Sharrow Bay to Swarthbeck and again near Side Farm. The watercourses that enter the lake from Glencoyne Beck to Watermillock have seen work in recent years. So the distribution of the weed is widespread whilst the population is declining. Removal of the plant is simple and straightforward. Being shallow-rooted, it is easily pulled out. Then snap the stem just above any root (including the reddish aerial roots) and leave in a discreet pile, or cart off in a bin bag for transfer into your green ‘wheely bin’. As well as work parties from the National Park and Eden Rivers Trust, I operate mini work parties most Mondays until early September. Please feel free to join me but don’t feel that you need to stay all day. Each day starts at 10 am but the start point will vary. Please contact me (see below) at the weekend prior to any Monday if you would like details. I operate until about 3 pm. Wellington or waterproof boots, waterproof clothing and gloves are recommended. Dense stands suffocate other plants so when it dies away in the winter, river banks are left bare and more liable to erosion. The flowers produce copious amounts of nectar and draw pollinating insects in preference to native plants so reducing pollination and hence survival of the latter. The black, spherical seeds are about 2 to 3mm across and can travel along waterways to infest new areas, even germinating under water. It tolerates low light levels and, in turn, tends to shade out other vegetation, impoverishing habitats.